Rope Caulk is putty in a roll. It can be applied around the edges of windows to reduce uncontrolled air infiltration and exfiltration, moisture condensation and seal against dust, dirt and insects. Install by simply pressing it into place with your fingers. Easily applied, self adhering and easy to remove. 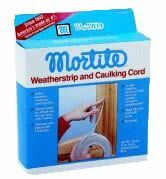 Rope caulk is an especially good option for apartment residents. One roll is 90' long, which will seal 6 average-sized windows. Gray.